So, we were all excited by the rumors flying in the entertainment press that writer-director Colin Trevorrow, who lives in Burlington, was going to direct Star Wars: Episode VII. Trevorrow dispelled those rumors when he tweeted on November 18: "To clarify, there is another film we all love that I'm currently trying not to mess up. Odds I will direct Episode VII: 3720 to 1." Now Variety has revealed the name of that "other film": a remake of Flight of the Navigator, the 1986 Disney flick about a kid who vanishes and reappears eight years later under mysterious circumstances involving a flying saucer. Trevorrow and his writing partner, Derek Connolly, will script the remake, "which will be developed as a potential directing vehicle for Trevorrow," says the industry journal. Looks like Hollywood really took notice of the human touch the duo brought to science fiction in their indie drama Safety Not Guaranteed. 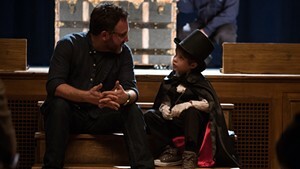 Read what Trevorrow told Seven Days about it, and stay tuned.